When a bunch of talented weavers get together for a workshop? 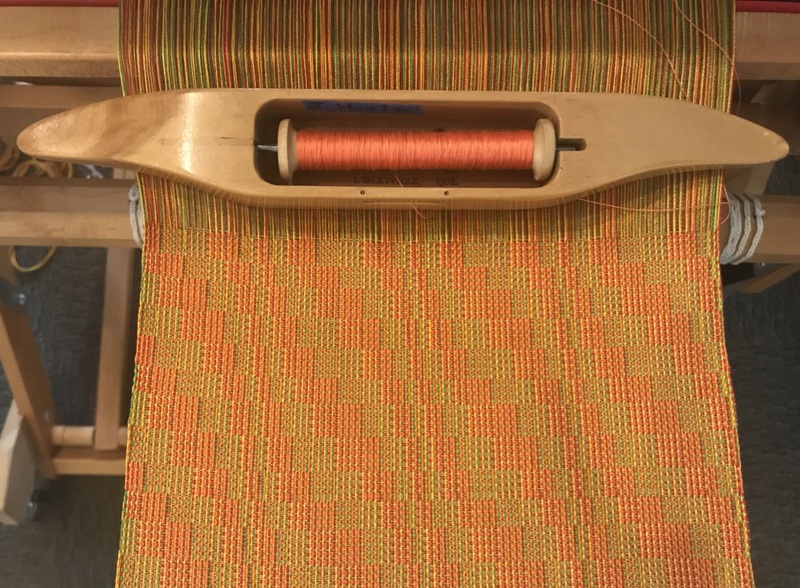 The workshop, "Echo and Jin for 4 Shafts and More," aims to help weavers explore various tieups and treadlings for Echo and Jin (Turned Taqueté) in either 4 or 8-shaft threadings. 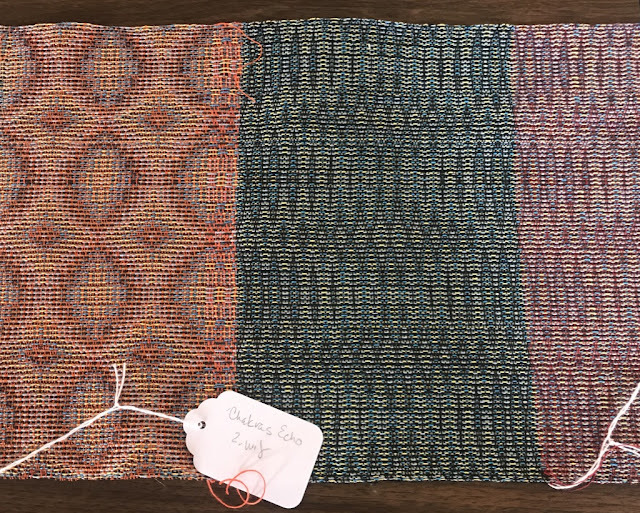 I taught it at the New Hampshire Weavers' Guild in Concord, NH, this month and discovered there was more to the lesson plan than I thought. Turns out, the workshop is as much about exploring color as it is about structure. Participants have the choice of working with a 2-color warp or a 4-color warp -- and with either choice, the weft colors make a big difference in the final results. This can be surprising, especially when you consider that both Echo and Jin are warp-emphasis designs. 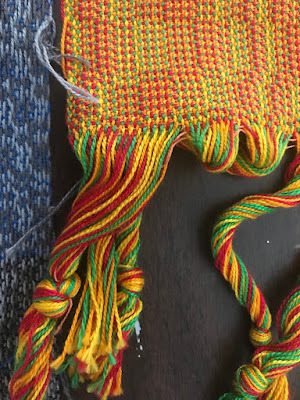 So, back to color and how important weft colors are to the final look. 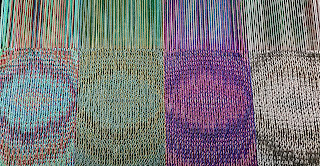 Mary Ellen Burnett took this photo to document her weft colors. The pattern is "Blooming Leaf" on 4 shafts. 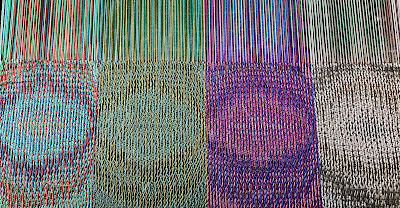 The photo above demonstrates how varied the samples can appear depending on the weft yarns. And this doesn't even touch on variations in the patterns themselves, as you change your tieup and treadling. For the four-color warps, which create what Stubentisky calls "iridescence" in her book, Echo and Iris, students chose a wide array of hues and values. Here are some examples. In preparing for the workshop, I spent a lot of time weaving up samples and coming up with rules for choosing 4 colors for your warp. Turns out, the above examples did NOT follow any of my rules and they worked out beautifully! Anyhow, for what it's worth, here's the gist of what I came up with. 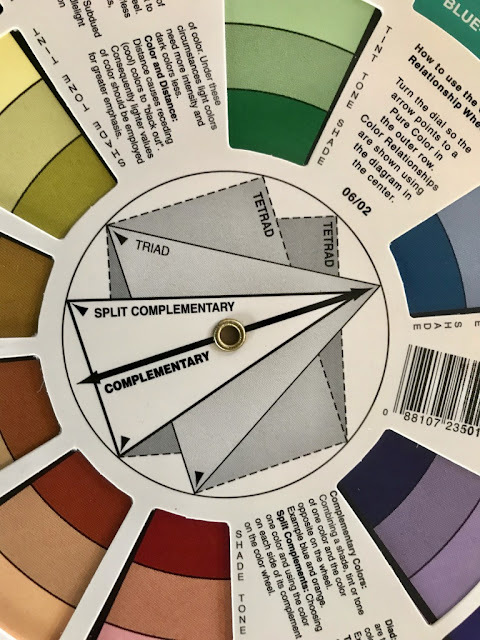 See the dark-gray square labeled "Tetrad" on the color wheel? My theory is that 4-color warps work best when you choose colors from each point on this square: in this case, starting from the top-left corner of the tetrad, olive green, then (covered up by the lettering on my color wheel) dark teal, then purple, then rust red/brown. Or you can change the value, moving up to the next level of colors on the wheel and, beginning again at the top-left corner of the tetrad: pale olive, light turquoise, lavender, and salmon/tan. And then there are the color choices for your wefts, which are often counterintuitive. Khaki works well with all kinds of warp colors, as do olive green, navy, dark purple, and even black. One of the key takeaways from this workshop is that you have to move outside your comfort zone in choosing colors, because the end results are seldom predictable. I started joking that I was going to rename the workshop, "You Can't Judge a Warp by Its Color." And it's true! Some color choices are unusual and wonderful: for instance, my host, Molly McLaughlin, hand-painted two warps in Kelly green, bronze, and black and beamed them together for her samples. After experimenting with a number of weft colors, she chose a dark purple, with stunning results. 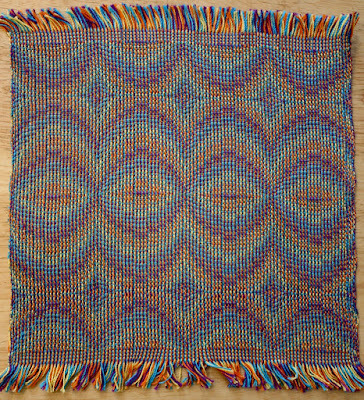 Molly McLaughlin wove a 4-shaft pattern called "Op Art"
using two hand-painted warps for her two warp colors. Molly was concerned that my colors looked muddy -- and I responded that I like them muddy! I am very happy with the results and I learned a lot from her. 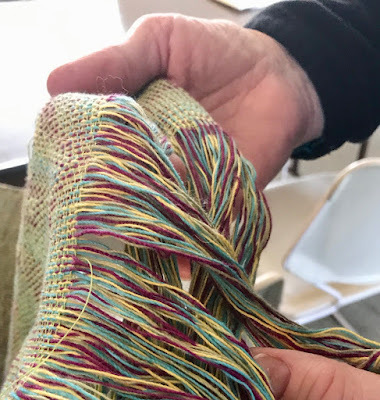 Our friend Deb Kaplan -- another wonderful weaver who belongs to the Complex Weavers study group in fine threads -- joined us for our dyeing session. 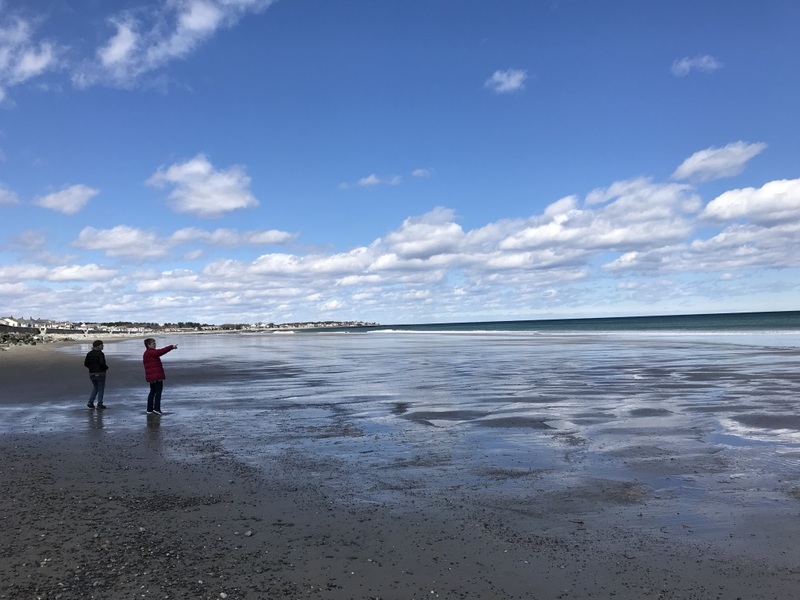 And in between, we managed a walk along the seashore near Molly's home in New Hampshire. Now I know where Molly gets her inspiration! Color and pattern are everywhere we look. And we respond powerfully to touch, to the textures in our weavings. What happened in New Hampshire is what happens when weavers get together and do what they love to do. 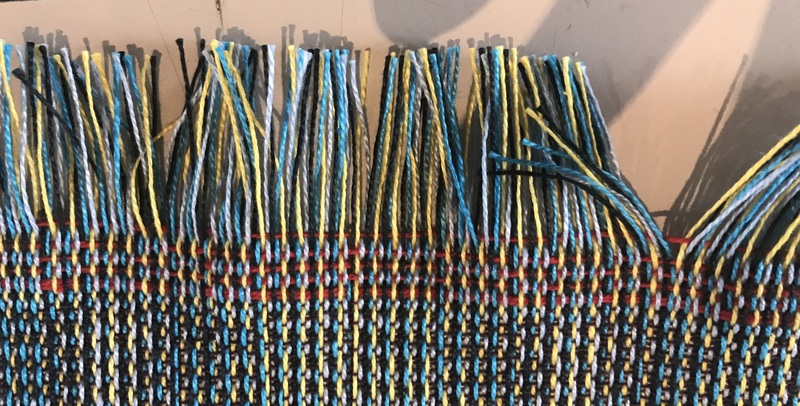 Over the past couple of months, I've been weaving up samples for an April workshop with the New Hampshire Weavers Guild. I've learned some great lessons, mainly in terms of choosing colors and yarns that optimize the look of 4-color Echo. Anyhow, my takeaway from all this sampling: Go big and bold or go home! First I'll talk about going big -- that is, yarn grist (a.k.a. weight and thickness). 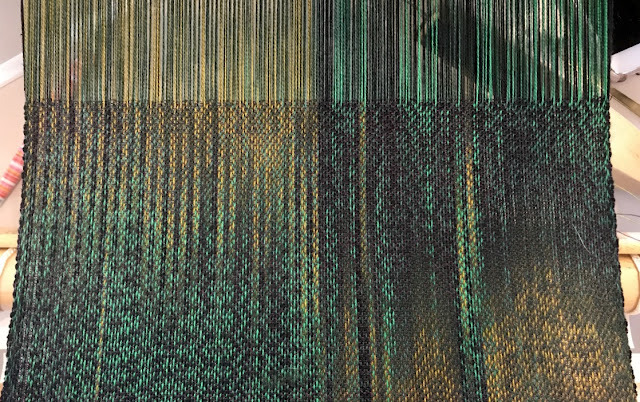 The sample at the top of the page, on 8 shafts with a 4-end parallel threading, is my favorite of everything I've woven so far. The warp is 10/2 pearl cotton and the weft is 20/2 pearl cotton. For comparison, here's a similar pattern on 16 shafts. To me, the second piece isn't as successful. There are lots of reasons, but the simplest is the difference between the 10/2 and 20/2 cotton warps. The 20/2 cotton is too fine a yarn to display the Echo pattern strong and clear, while the 10/2 cotton provides a much better display. 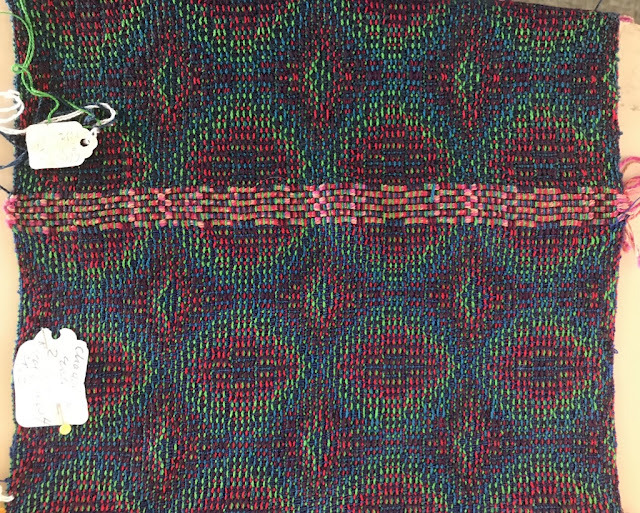 I'm not saying that this is a binary choice, because I do like the 16-shaft version using 20/2 cotton -- but the heavier yarn defines the pattern better. And what about going bold -- that is, in terms of color? I could write a book on this (so many people have), but the point I want to share is that your warp colors are barely half of the story. Weft and pattern can make huge and surprising differences in the look of your fabric. And the more colors you have in the warp, the more surprises you may have in your results. 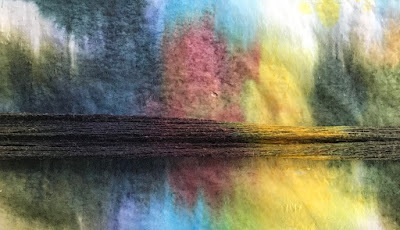 Choosing colors for polychrome Echo is counterintuitive: The colors in the warp may not look at all harmonious to you, while the end results can be beautiful. 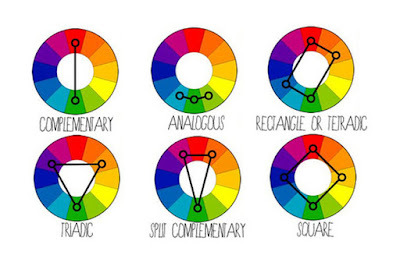 Take a look at the color diagrams below (these thanks to Widewalls, an online art gallery and magazine based in London, which you might want to check out for its excellent article on color theory, "Color Theory Basics You Need to Know"). 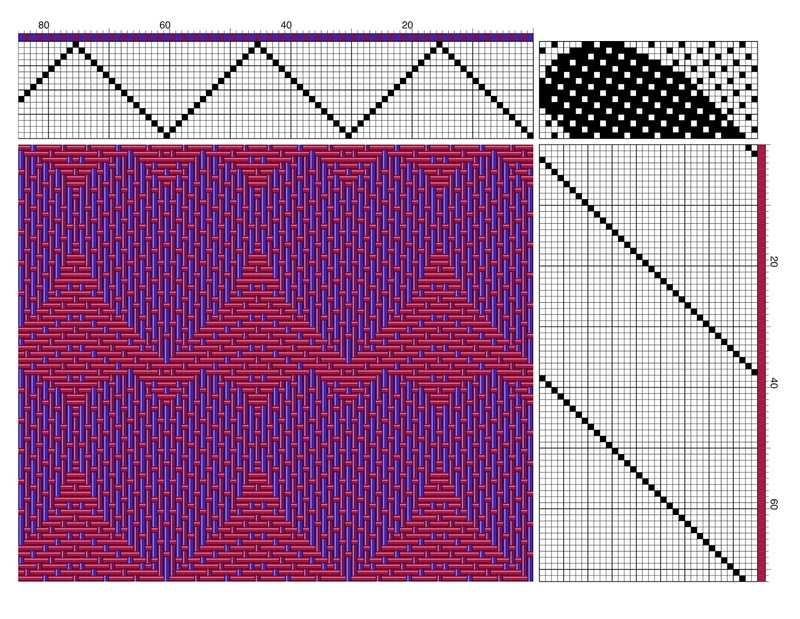 For a four-color Echo warp, your best bet is to choose a square color scheme (the example in the bottom right corner of the diagram), with each of your four colors taken from the corners of a square drawn on the color wheel. The rectangle color scheme (the top right example) would also work. And here's what I did in my samples. 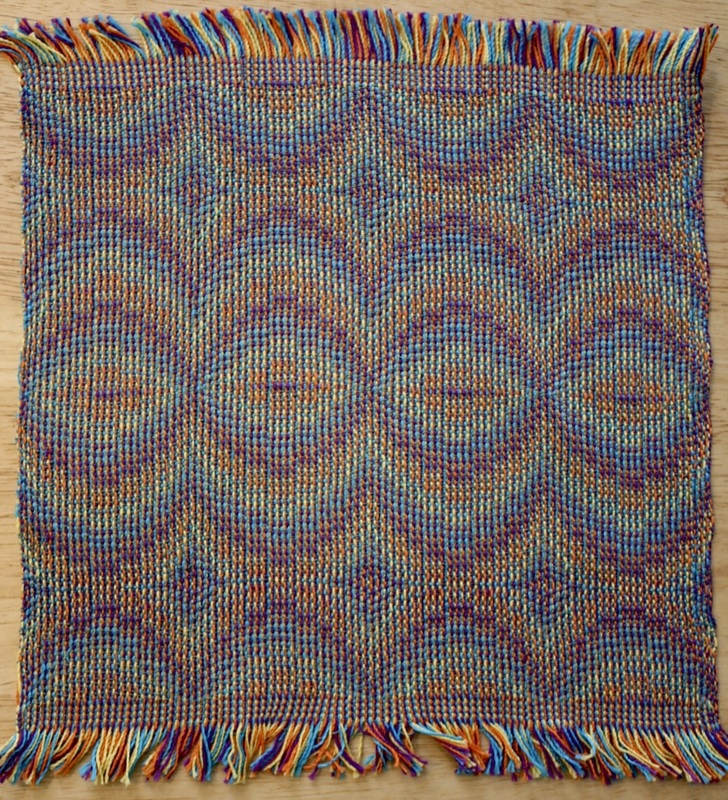 For the design that appears at the top of this post, my warp was 10/2 pearl cotton in yellow, orange, purple and turquoise -- which is a square on the color wheel (start at yellow, move three blocks counterclockwise to orange, continue three blocks over to purple, and then three blocks over to turquoise). 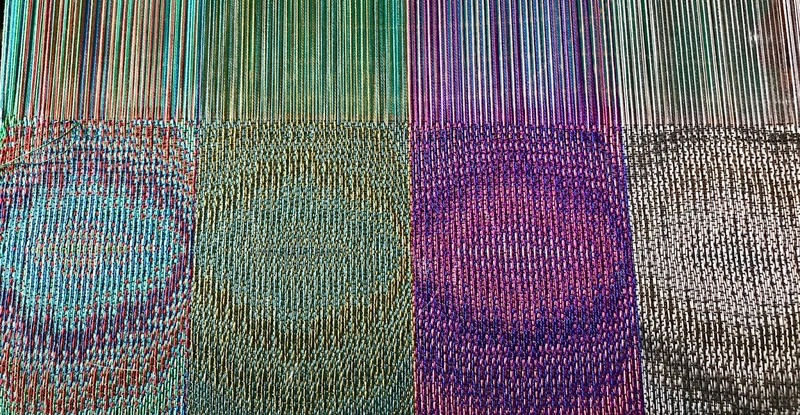 And you can see the colors as they emerge in the pattern (above): first orange, then yellow, then turquoise, then purple. 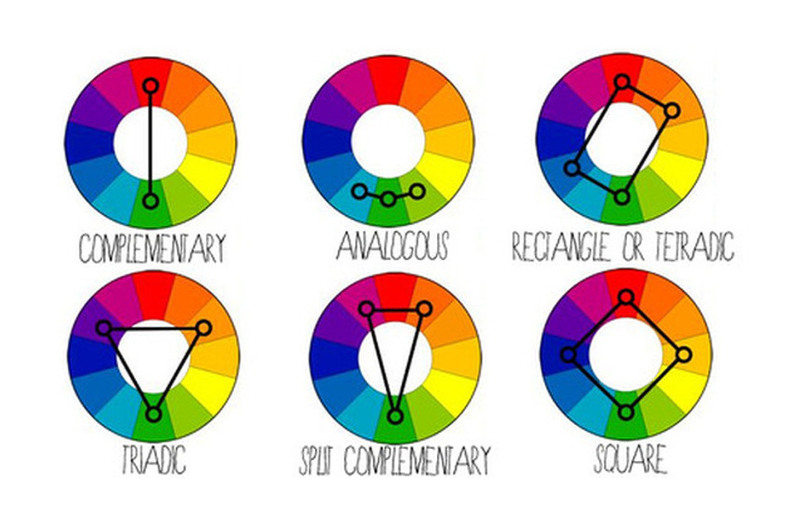 (That was the color order for my threading.) 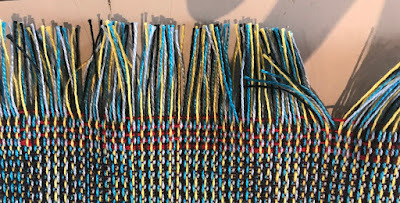 The weft was 20/2 pearl cotton in turquoise. I wanted to try a color sampler, so each motif has a different set of warp colors. The first, on the far left, uses lime green, turquoise, red, and royal blue -- again, not quite a rectangle on the color wheel, more like a trapezoid, but I like the way it works. The second motif uses very subtle colors: teal blue, dark turquoise, olive, and brass, and it doesn't hold a lot of interest for me. 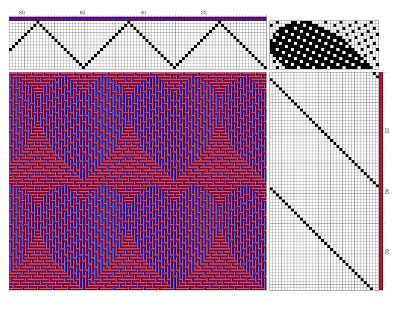 The third motif uses pink, fuchsia, purple, and royal blue and, although the pattern is relatively distinct, I find the colors too sweet for my taste. The last motif, on the far right, was really just a shot in the dark: I used beige, gray, black, and tan in the warp just to see what these neutrals would do. And the results are... neutral. I'm so glad I did this analysis, because in the future I will have some rules to go by in choosing colors for 4-color Echo. Then again, maybe I will have some rules to break. Thanks for reading. And happy weaving! 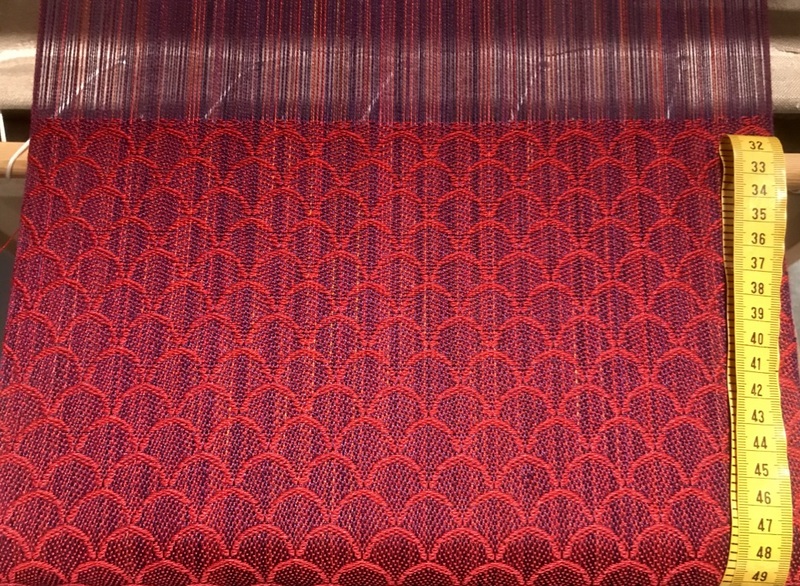 Weaving Heartfully: Happy Valentine's Day! "heartfully." en.oxforddictionaries.com. With the whole heart; with enthusiasm, conviction, or intense feeling; warmly, cordially; devotedly. What a great word! And what a great draft. I found it online, probably on Pinterest, and I have no idea where it came from, unfortunately. (Please let me know if you recognize this from someone or somewhere.) In any event, here's what it looks like in Fiberworks. And then I got to thinking: Valentine's Day is here. So why not take this design and turn it into heart shapes, just by altering the tieup? Take a look at the scallop shapes in the tieup above. 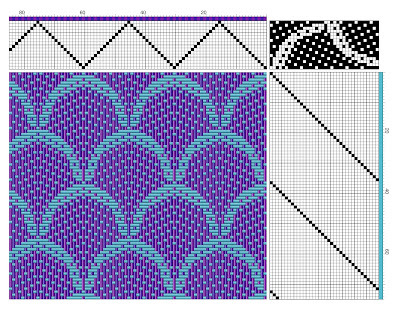 It's a damask weave, so the tieup is warp-emphasis for the purple sections in the drawdown and weft-emphasis for the turquoise sections. [Damask is defined as a fabric formed from satin (warp yarns floating over 4 or more wefts) and sateen (weft yarns floating over 4 or more warps) weaves, used to create reversible figured designs.] 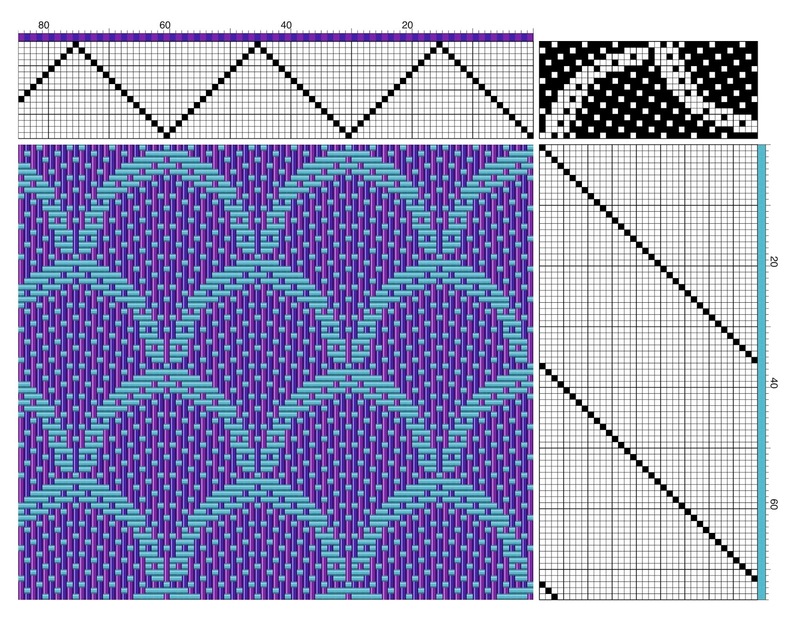 And the motif is split in half, because when you thread a point draw (shafts 1 to 16 and back down to 1), the motif reverses itself, creating the second half of the scallop shape. I played around quite a bit, working to create a warp-emphasis heart shape against a weft-emphasis background, which required tie-down warps and wefts placed strategically. I had to keep in mind that there would be floats, because you really can't expect to have tie-downs in total symmetry. What's more important is the silhouette of the heart shape. So here's what the draft looks like now. I haven't woven it yet, because the original design is still on the loom -- but I could change that easily, right? That's the beauty part of having a computer loom. So there you have it, a heartful draft for Valentine's Day! Thanks for reading. Oh and one note before I close: Google Plus will be shutting down in March, which means that people who subscribe to this blog through Google Plus will no longer get my posts. 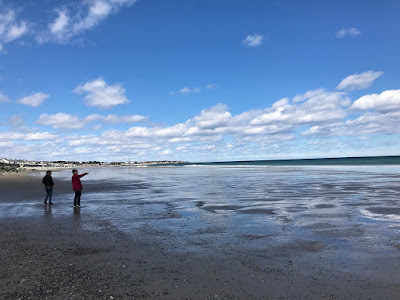 So please change your method of receiving posts by clicking "Follow" in the blue rectangular box below all the miniaturized photos on the left-hand margin of my home page. Or you can click on the red box under "FeedBurner Subscribers." Either way, I hope you'll continue as a follower. I appreciate you being a part of my online community.